As Peter mentioned, I recently turned 40. Well, not actually, but I did buy a sports touring bike. I must say that my Yamaha FJR is nothing like a GoldWing. This thing takes the twisties without breaking pace and holds 150 on the highway without breaking a sweat. It's a totally different machine than the KLR. I'm feeling more and more at ease in the saddle and I've already put on 5,000kms this season. When my good friend Kathryn decided to get married in Austin, TX I felt the call. The idea of a cross U.S. road trip has always held appeal. 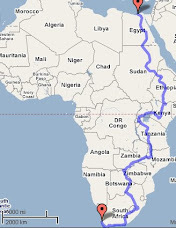 This trip is ambitious, but it feels realistic. Somehow this week I feel that we closed the final chapter of our trip: Ability Moving and Storage filed a “no contest” plea to our breach of contract suit in small claims court and refunded the value of the contract. I was tempted to carry on and see what a judge would rule on issues of consequential loss, but I had already wasted enough time and the law seems to favour the shipping companies heavily. We hired Ability to ship our two bikes (expertly crated up by Peter and Rob at North Bay) from Montreal to the Port of Alexandria and clear the crate through customs. For the second portion of the contract we paid Ability $1250, above and beyond more than $2500 simply for the transport. At the time this fee seemed expensive, even extortionary, but we saw this expense as an acceptable “insurance policy” to maximize the chance that our bikes were ready for us upon arrival and that we were exposed as little as possible ourselves to the vagaries and entrepreneurialism of Egyptian ports bureaucracy. Not only did Ability provide no service for the $1250, but they refused to refund the amount until I took the issue to court. Upon arrival in Alexandria, it became clear within several moments that the customs clearance portion of the contract was never passed on by Ability to their subcontractor and consequently not from the subcontractor to the receiving agent, Egyptrans. Basically, we were stuck with the task of navigating through the customs process ourselves. Ability was never able to explain why the contract was never passed to their subcontractors. Looking back after the conclusion of a successful trip, this turned out to be the kind of life experience that makes you stronger, but at the time it was a source of great stress. We spent a total of five days in Alexandria, guests at the Hotel Jedda, scrambling to understand due process and shady characters, beseeching taxi drivers to speed up just a little, and culturing pity from the biggest boss we could find. Peter and I laugh now about how we showed up at the port on the first day – with jerry cans of fuel and oil – thinking that we would be ready to hit the road to Aswan by early afternoon. By the end of the day, we had managed only to get a pass to enter the port! With each passing day our window of opportunity was closing to make the twice weekly ferry from Aswan to Wadi Halfa, Sudan. At one point, I was interviewed by the intelligence services. I had the young officer navigate to this blog as proof of our legitimacy. He asked is he could send me an e-mail sometime and promised to follow our trip. In the meantime Peter had been sitting in the sun for hours after a minor altercation with the Top Dog at Gate 5. When this general or major saw Peter sitting near the door of the Gate’s office, all he could muster was “Zis ezzz wrong! !” – with the exact exasperated pronunciation of a Nazi officer unable to accept defeat. At first, it was hard to get a straight answer and we spent half-days chasing our tails. Our situation became positively Kafkaesque when we finally gained entry to the port, towards the end of the afternoon on day two. Upon the advice of our new “friends” at the Gate, we set out to the west in a search from Gate 22 (or some similarly high number). The bus took us to Gate 15 before turning around and heading back to where we had started. Turns out Gate 22 was in a completely different port about 30 kilometers further up the coast. We returned to Gate 5 to exit and find a taxi to the other port. But they wouldn’t let us out. So Peter asked several officials which gate was the right one to use as the exit. He got varying answers, including from the same person. The Top Dog took a delicious glee in telling him the Gates 1, 2, and 3 was each the only gate for us. We finally exited via Gate 1 through a combination of smooth talk and bullying. The next day was a Friday and we joined hundreds of other Alexandrians on the beach for the weekend holiday. The window kept closing. Looking back in my journal, I took surprisingly few notes about these days. Perhaps it was because it was too difficult and depressing. Now, I can’t help but laugh and with genuine enjoyment. We met so many characters. Perhaps the most notable was Mr Yassin. This low level bureaucrat was eventually assigned, in a highly irregular managerial decision by the Director of Customs for the Port, to be our personal Sherpa. He either spoke no English or pretended not to. He was a parasite, but at least he was our parasite; his goal was to see a nice payday and so he had a strong incentive to get our crate out of port. He held on to our papers until the last possible moment, practically at the port’s outer limit. He then fished out all the bills in Peter’s wallet before handing over our ticket to the road south. Luckily, Peter had passed me half his wad just prior. Was this a bribe or a service fee? The answer is complicated; after all, he was an official at the port. On the other hand, his actions were no different than what a broker might do and we would have paid a broker without hesitation. One of the things I marvel at most is how different our experience was in terms of shipping the bikes back to Canada from South Africa. Perhaps we got lucky there, because we came into contact with Nick Van Zyl, a motorcycling enthusiast who also owned a shipping company. We were small potatoes for him, but he took a real interest in our situation. In the end, his bill came to half of what Ability charged us.